FreightSnap DMS (Density Management System) is a software soltion that lets you access all the shipments, measurements and photos collected by your dimensioner. Use it by itself, or in conjunction with your current WMS, TMS or ERP. FreightSnap DMS gives you complete control over all the data you collect. When your dimensioner measures and photographs your freight, it sends that information, along with an ID# to straight to the DMS. When you log in, you’ll see every shipment listed in chronological order. 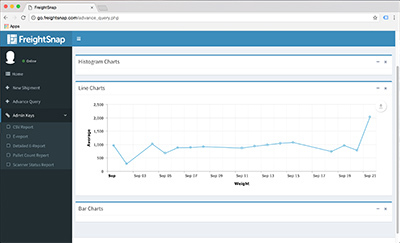 Using the built-in filter, you can search for individual shipments by date range, location, ID #, dimensioner ID, user, and other metrics, making it easy to find any shipment, no matter how long it has been in your system. 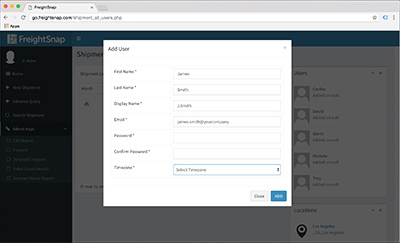 FreightSnap DMS lets you set users up with varying levels of access, allowing everyone to see only what they need to. Give floor workers the ability to upload and view shipments, and let managers edit shipments and study analytic data to improve operations. Have a shipment that’s been audited for size? Maybe a pallet arrived at its final destination in less-than-perfect condition. No problem. 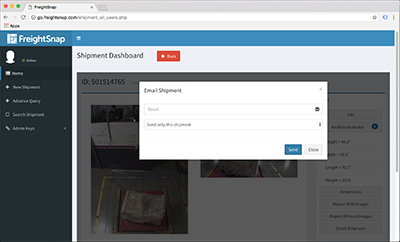 FreightSnap DMS lets you quickly share the measurements and photos of your shipments so you can avoid freight audits, or provide the photographic evidence needed to successfully file a damage claim. Manage freight data across your entire enterprise. FreightSnap DMS supports multiple locations, giving you the ability to see how each warehouse or terminal is performing. Our responsive platform works on any device – desktop, phone or tablet. Want additional functionality? Let us know what information you’d like to see and we’ll work up a custom quote for your system. Use FreightSnap DMS to access the measurements and photos collected by your dimensioner, no matter where you decide to store your information. Learn more about our storage solutions here. Save all the data collected by your dimensioners to our cloud storage solution (hosted by Amazon Web Services). We’ll set you up with a private account and login, which you’ll use to access your data through the DMS. Send all the data collected by your dimensioners straight to a Private Cloud Storage solution created exclusively for your business (also hosted by Amazon Web Services). Access your freight data through the DMS, which will be set up on the same Cloud network. Send all your data to your own company servers. We’ll install FreightSnap DMS software on your system, allowing you to log in and access your information. We’re happy to answer your questions and help you explore all the dimensioning options available to your business. "Send us a quick message to start your conversation today."